As one of the most exciting young soloists emerging from Scandinavia, Swedish born violist Ellen Nisbeth, recently selected by ECHO (the European Concert Hall Organisation) as one of its ‘Rising Stars’ of the 2017/18 season. Making her debut on the international music scene performing at prestigeous venues, such as Concertgebouw Amsterdam, Barbican Center London, Musikverein Vienna, Cité de la Musique Paris and BOZAR Brussels among others. As a soloist, Ellen has performed with leading orchestras such as the Swedish Radio Symphony Orchestra, the Norwegian Radio Orchestra, Bergen Philharmonic Orchestra, Trondheim Symphony Orchestra, Brandenburger Symfoniker, Gothenburg Symphony Orchestra and Norrköping Symphony Orchestra. She has collaborated with conductors as Neeme Järvi, Daniel Blendulf, Peter Gülke and Santtu-Matias Rouvali. 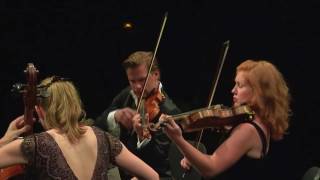 The Swedish viola solist appears frequently at international festivals such as Bergen International Festival, Oslo Chamber Music Festival, Stavanger International Chamber Music Festival, Risør Chamber Music Festival, Vinterfest and Verbier Festival. Musicians she has performed with include: Martin Fröst, Leif Ove Andsnes, Akiko Suwanai, Daniel Hope, Ray Chen, Natalie Clein, Truls Mørk, Martin Helmchen, Alexander Melnikov and Bengt Forsberg. Nisbeth regularly gives master classes and since 2015 Nisbeth is appointed Associated Professor at Stavanger University Music Department. Ellen also teaches at Edsberg Manor, Royal College of Music in Stockholm. She performs on a Dom Nicolo Amati viola from 1714.